Most homes in southern California are built on “slab-on-grade” or “raised” foundations. To ensure that the addition will look and feel like an authentic part of the house, it is recommended to maintain the same type of foundation throughout the house. 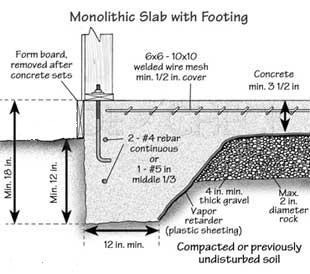 Slab-on-grade: This type of foundation would usually include concrete slab surrounded by concrete footings, and should include all of the following stages. Lumber boards secured by stakes are installed around the perimeter. The size, location, and squareness of the slab (and subsequently the entire addition) are being determined at this highly important stage. The area of the addition is graded to approximately six inches below the level of the existing slab. Ditches are dug around and across the new pad. 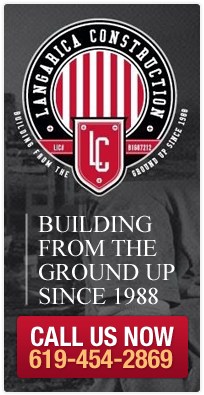 Depending on the city’s requirements, type of soil, and height of the structure, the footings are typically 24 to 30 inches deep and 12 to 18 inches wide. 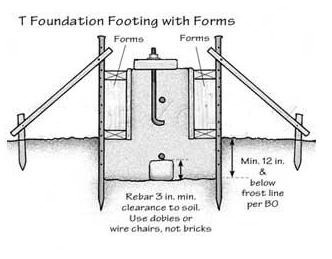 Interior footings are laid under interior-bearing walls. To prevent access of moisture from the soil onto the new slab, a 10 mil polyethylene sheet is placed over the pad and into the footings. Two inches of sea sand under the concrete will provide flexibility and sustainability to Earth’s movements. One-half-inch rebars (AKA #4 rebars) are laid and tied across the slab, and are spaced 16 inches on center each way. The network is placed on two-inch by two-inch concrete Dobie blocks to ensure its positioning inside the slab (and not under). Premixed concrete is pumped into the ditches and over the pad. To ensure a smooth result, the finishers will level the mud and work the surface until it is dry. Slow curing concrete equals a stronger slab, and since concrete is a thermal curing material (which means, it projects heat while drying), it is highly recommended to water spray the new slab a few times a day for the first couple of days. Raised foundation: There are many types of raised floor systems, but, these days, the most common one in southern California is designed with concrete stem-wall and pier-supported girders. The area of the addition is graded to 18 inches below the bottom of the floor joists of the new addition. Ditches are dug around to form the new footings. Square holes are dug where new concrete piers will support the girders. Lumber boards secured by stakes are installed around the perimeter to form the shape of the new concrete stem walls. Horizontal and vertical rebars are laid and tied inside the forms to provide longitudinal reinforcement. Premixed concrete is pumped into the forms and pier holes. The finishers will work the top to ensure leveled walls.